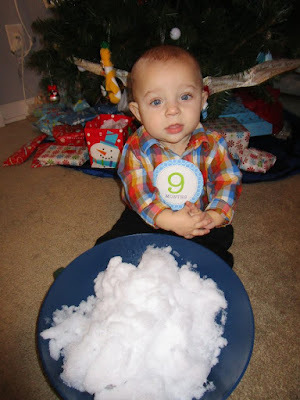 Hudson's Trials and Triumphs : 9 Month's Old! Hudson has officially mastered sitting. He has finally gained some weight this past month and weighs roughly 15.3 lbs. He has recently learned to bear weight on his legs so we are practicing a lot of standing these days. Unfortunately, if he knows there is a seat like on the exersaucer or jumperoohe won't try to stand in them. So we have to practice standing other ways. PT and OT are going great and we can see improvement each week. We can tell he is getting stronger and stronger, little by little each day. Hudson still won't drink any bottles or anything from a sippy cup nor eat any food. This is very common for kids whose kidney's do not work. He sometimes surprises us and takes a lick or two of whatever food might be in front of him. But for now almost all of his nutrition is still just breastmilk with a little bit of formula added in for extra calories. We have our monthly renal appointment this week so we are hopeful to see what his lab work shows us. This is month two that we have been off of blood pressure meds and are wondering if maybe his kidneys are working a little bit. Only the numbers will tell and we'll update you after the appointment! Thank you to all who continue to follow Hudson's trials and triumphs and for all the many continued prayers.